2006 Suzuki S40 Boulevard, STELLA, 1st bike! When going bike shopping a few weeks ago I knew what I didn't want and it was a 1-cylinder, black bike or a Suzuki. 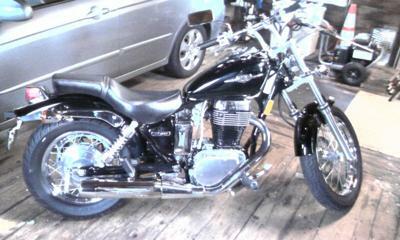 So, of course I walked out with a 2006 1-cylinder black Suzuki Boulevard (go figure)! I have zero regrets and am finding Stella to be a the right first bike. Loving the black and chrome. She's super light at less than 350lbs wet but has the look of the larger classic styles that I favor. I tightened up the rear brakes a bit and am looking forward to getting to work on my machine since on the car I don't usually get to do more than change a tire or a headlamp. I have a Nelson Rigg sport tank bag on the way. It was tough to find something that fit the leaner tear-shaped gas tank but the tank was one of the reasons I got this bike. When test sitting, I felt intimidated by having wider tanks in front of me (a mental/visual thing). The put in a new battery, new tires and front breaks. 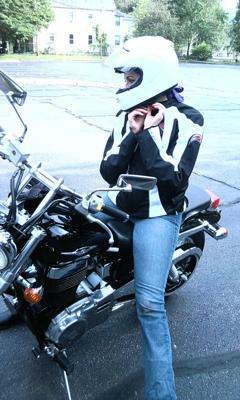 Comments for 2006 Suzuki S40 Boulevard, STELLA, 1st bike! Too bad we didn't live closer, we could take the sisters out for a ride! Every time out is better and it's feeling great! You were right when you said she'll let you know if you got shifting wrong (what a clunker). But, it makes it all the more obvious when you do get it right. I think I found where she likes to go from 2nd to 3rd and I had a few smooth ones (aha moments) where the transition was as seamless as I'm going to get it. I worked on smoother downshifting-trying not to engine break so hard. I took her to the gas station today for the first time to fill her up and put some air in the tires. This must be what a kid feels like-even the most mundane tasks are new and exciting. Ha! I did have a tough time getting the station air nozzle to fit around the spokes. It's was only my fourth time out today and I'm happy and enjoying the progress but can't wait till I'm comfortable enough to actually take her someplace (like work, or the store)! Do doubt I'm going to need more storage. Hey Steph...I think Sophie and Stella could be sisters (ha ha). How does she feel for you when you ride? I am still working out the gear shifting with mine, but I will get it in time. I hear you about the wider tanks, they scared me as well. Although I could put my feet on the ground, the bigger tanks scared me because I did not feel in control. Sounds like you made the perfect choice! Have fun & keep us posted.